The Something Blue Mint Tins are a colorful accent to any table and perfect party favors. The 5/8" x 1 3/4" personalized mint tins include 0.45 ounces of peppermints. Each of the Something Blue Mint Tins can be personalized with your own custom text. Assembly required. Candy Land is a trademark of Hasbro and is used with permission. Copyright 2012 Hasbro. All Rights Reserved. 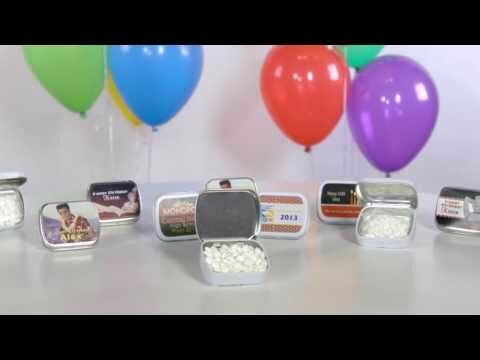 Personalized Mint Tin features: Free personalization! White metal tin. Measures 2 1/4" wide x 1 3/4" high x 5/8" deep. Includes 0.45 ounces of sugar-free peppermints. Assembly required.